Welcome back for the second weekly installment of The Lucky 13, The Vault's summer-long collaboration with Brutal as Hell. After last week's descent into the debauchery of grindhouse and exploitation, this week we visit one of the most traditional of horror sub-genres, perhaps the most traditional of all--monster movies and creature features. Technically speaking, if one were in the hair-splitting mood, these two can indeed be separated into distinct sub-subgenres, with monster movies implying more old-school humanoid beasties, and creature features referring to more of the giant-behemoth-on-the-loose premise. But for our purposes this week, we're taking an all-inclusive look at the bizarre, other-worldy abominations of nature that haunt the history of horror cinema! This could very well be the most skillfully made horror film of them all--certainly of the so-called "classic era" of horror movies, in which, very often, they were treated as mere children's fare. 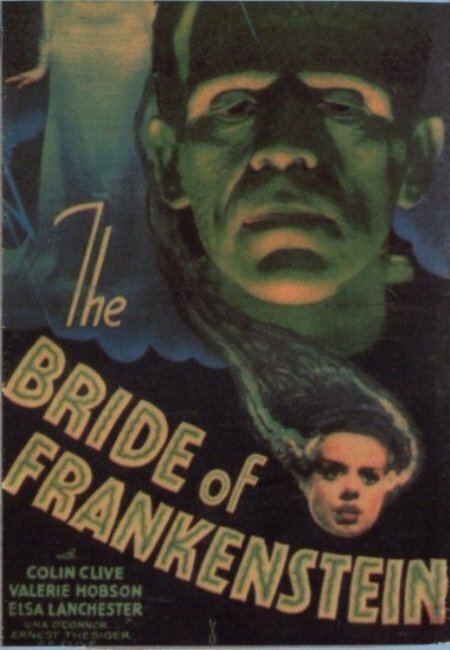 Bride of Frankenstein is so much more than that. It's a sublime expression of cinema as art, wrapped subversively in the guise of a monster movie. For one thing, the film is tinged with a daring Christian allegory that only adds to the viewing experience. Who would've thought that the Frankenstein monster could become a Christ figure, yet this movie does it. Heavy stuff for a creature feature! Bride of Frankenstein is filled with unforgettable scenes. Chief among these is the rightfully famous log cabin scene with the blind hermit. Parodied in Young Frankenstein almost as famously, this is nevertheless one of the truly immortal film scenes, and for my money may be the most emotionally moving one I've ever seen in a horror film. It's for moments like this one that the film totally transcends the genre. Bride of Frankenstein is a film that is far more sublime and wonderful than it has any right to be. Filled with remarkable imagery and delightful performances, it is the kind of film you show to someone who has yet to appreciate the finer points of what genre entertainment has to offer. There is a handful of horror films of such high quality that one can literally classify them among the greatest movies ever made. Bride of Frankenstein is one of them. It's the shining triumph of the beloved Universal cycle of monster films. These days I'm over moaning about remakes, but I used to get pretty angry about the entire notion. It just doesn't make any sense to me. While complaining about remakes, though, I would always conveniently forget that one of my favorite John Carpenter movies is, in fact, a remake in the most genuine sense of the word. 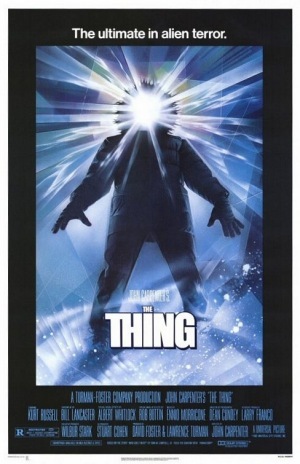 Remakes often keep the general framework of the source material intact while taking giant liberties with the specifics, and that's pretty much what's happening in The Thing. John Carpenter is a noted fan of the 1951 Howard Hawks film, The Thing From Another World, which is in turn based on a 1938 short story called Who Goes There. Hawks' film keeps the general idea of a frozen alien space ship, but throws out a lot of the short story's details in favor of casting a tangible villain with a hideous appearance. Carpenter's remake actually comes a lot closer to Who Goes There by setting the movie in a location as remote as you can get, Antarctica, and then pits a small arctic research team against a monster that it really can't even see. This is the weirdest part of choosing The Thing as my monster movie pick because when you get down to brass tacks, the titular Thing is actually a microbe that takes the form of the research team, occasionally revealing itself to be a nasty piece of bio-horror as it assimilates its victims. By the end of the movie, its true form is revealed to be a throbbing tower of flesh and teeth, but on the way, the monster--usually the draw to these monster movies--just looks like the rest of the cast. Carpenter's flick is an examination of paranoia, and a spiral of horror that suggests that the craft they found may not even be The Thing but it's latest victim, and Earth is its latest conquest. Though the original Hawks picture is a monster movie by definition, Carpenter's version manages to fall just inside the confines because of its ambiguity. I'm in love with Rob Bottin's unbelievably nasty special effects, too. When the movie suddenly starts to feel like a body horror movie, someone's severed head sprouts legs and beats a hasty retreat. The Thing is colorful, completely nasty and is home to a brand of paranoia that is downright suffocating at times. 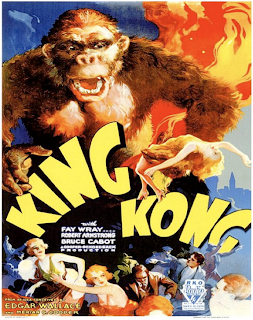 In the pantheon of giant monster movies, King Kong remains one of the reigning champions of the form, a king of the jungle in the most appropriate sense. It can’t be denied that this film seems to have it all: an engaging story, incredible special effects, and one of, if not THE, greatest scene of a giant creature’s rampage in a bustling metropolis. But there’s something that Kong possesses that other monster movies of its ilk seemed to have missed. King Kong has a wonderful sense of humanity, exhibited not only in the likable characters, but also in the monstrous form of Kong himself. Willis O’Brien and his team of expert technicians worked wonders in their exciting world of stop-motion dinosaurs and beasts. The smallest of details were rendered by their deft hands. I’m still blown away every time I see tufts of Kong’s fur blown by the wind. But those are just superficial matters. Where the genius of the special effects crew truly shines through is during the brief but ever-so-intimate moments when the audience is able to look past Kong’s roaring terror into the warm heart that lies beneath his giant chest. This is especially seen during one of my personal favorite moments, when Kong innocently but curiously plucks off Fay Wray’s garments. The looks on Kong’s face appear so cleverly human. We can relate to him. A 25-foot jungle ape that we can sympathize with. How can you argue over the greatness of something like that? But don’t for one moment be mistaken, dear reader. King Kong isn’t merely a sappy romantic comedy that has Tom Hanks replaced by a slightly more attractive lead. There’s red-blooded adventure and intrigue galore. And what’s a giant monster movie without scenes of terrible, wanton destruction and carnage? You’ll watch in rapt fear as Kong busts through the giant wooden gate that has kept him at bay for all these years. And who isn’t familiar with the instantly classic scene of Kong crushing his way through the skyscrapers of 1930s New York? Kong may be a softy at heart, but he never lets you forget that he is a titanic gorilla on a mission of death. He mercilessly stuffs humans into his mouth and grinds them into the earth under the weight of his colossal monkey foot. And as mentioned before, the craftsmanship of O’Brien is awesomely exhibited during the scenes where Kong wages hairy battle against the monsters of the island, most notably the snapping T-Rex. This is the stuff that dreams of Saturday matinee boys and girls are made of. The climax atop the Empire State Building has just as much resonance now as it did over 70 years ago. It’s the last stand of a beast from a distant world against the forces of a realm it has no knowledge of. Don’t be surprised if you feel a lump develop in your throat as Kong languishes on the building as the airplanes rain their bullets upon him. This is more than just a monster movie. This is cinema at its finest. Head over to Brutal as Hell to see what Marc Patterson and his crew have come up with. And if you're interested in taking part in the future, just give Marc or myself a holler. Great picks! Very cool to see Joe pimping King Kong, might have been my pick. Three of my favorite films here. 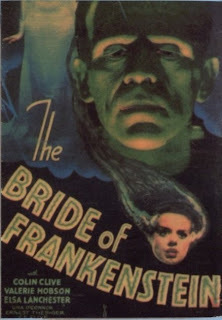 The Bride of Frankenstein is one of those classic films that helped kickstart my love for horror as a young kid (and it follows Shelley's vision a bit closer than the original film). Really the Frankenstein and BoF need to be viewed together in an extended sitting to be truly appreciated. I was very pleased with the other two picks this week, for sure. And BoF is definitely a comfort movie for me. Never get tired of it. Brilliant. TRAILER TRASH: Killer Animals Edition! Iron Sky Footage: Nazis in Space!! Happy Mother's Day from The Vault of Horror! The Tuesday Top 10: MORE Scary Paintings! TRAILER TRASH: John Carpenter Edition!